Age of children:Edinburgh & Midlothian’s first outdoor nursery is fully established, and caters for children aged 3 – 5 years. Treetops is a branch of Chapter One, which is a chain of nurseries within Scotland, England and Oman. Chapter One firmly believes in the benefits of outdoor learning and this is where Treetops’ inspiration comes from. The children connect with nature, get the fresh air and exercise they need, develop their communication, imagination and thinking skills; build their confidence and resilience and, most importantly, have lots of fun. The children take part in a huge variety of activities, such as building dens, making leaf pictures, creating fantasy worlds, cooking in mud kitchens, and caring for the environment, as well as having plenty of opportunity for free exploration of the woodland alongside experienced child-centered staff. The teaching staff are very well qualified, with a passion for outdoor learning, and understand how to cover all areas of the curriculum for excellence in an exciting hands-on way that children love. The children meet in the morning at the Treetops base within Dalkeith Country Park. The children come dressed in their kit with their bag. We start our journey by asking the children what they would like to do today and then we make our way to the Treetops site in the woods. We know our site very well as do the children, when we get there the first thing we do is assess the site using our child friendly benefit risk sheets. Once we know all is good we start setting up the site with the children. We put up a tarpaulin shelter if rain looks likely. The day is then a mixture of child-led exploration and play, coupled with Forest School activities. Adult interactions are sensitive, making sure the children are supported when necessary and empowered to direct their own learning and achieve their own goals. Around 11.30-12.00 we gather for our pack lunches and enjoy a rest and reflection on our morning. We have pop up tents and hammocks for the children who would like to rest. In the afternoon we do lots of fun activities, or we may go exploring around the woods depending on the children’s choices, we enjoy a snack around 3.00 pm and then around 4.30 pm we make our way to the Treetops base for home time between 5.00 -6.00 pm. We have lots of activities throughout each day and week, so that the children are always stimulated. However, we will revisit activities if the children wish to do so. Treetops Outdoor Nursery provides children with the opportunity to spend their days within the woodland, taking in the natural environment, experiencing the seasons first hand and developing their innate curiosity and love of learning. 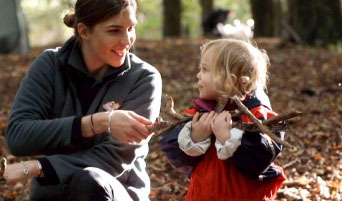 The children take part in a huge variety of activities, such as building dens, making leaf pictures, creating fantasy worlds, cooking in mud kitchens, and caring for the environment, as well as having plenty of opportunity for free exploration of the woodland alongside experienced child-centred staff. The teaching staff are very well qualified, with a passion for outdoor learning, and understand how to cover all areas of the curriculum for excellence in an exciting hands-on way that children love. We are open from 7.30am-6pm Monday – Friday 51 weeks of the year only closing over Christmas and New Year. the outdoor nursery and half day or full day places within our indoor nurseries.